This round posy dish is ideal for a table top or counter. Made in a dish with oasis these flowers include Lillies, Roses, Chrysants and foliage. This round posy arrangement of fresh flowers is ideal for someone who does not have alot of space. Fresh cut flowers arranged in oasis and a dish. 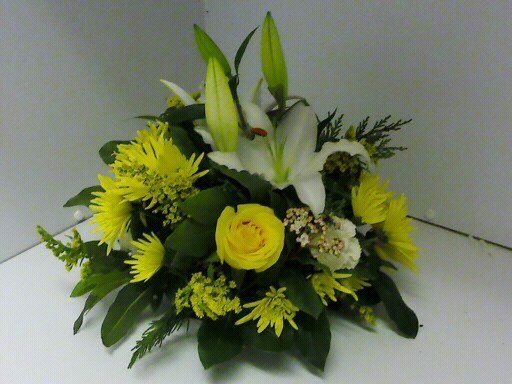 This floral arrangement can be made in different sizes and colours. Ideal for a birthday or get well gift. This all round posy arrangement of fresh flowers looks very nice with a mix of seasonal fresh flowers.